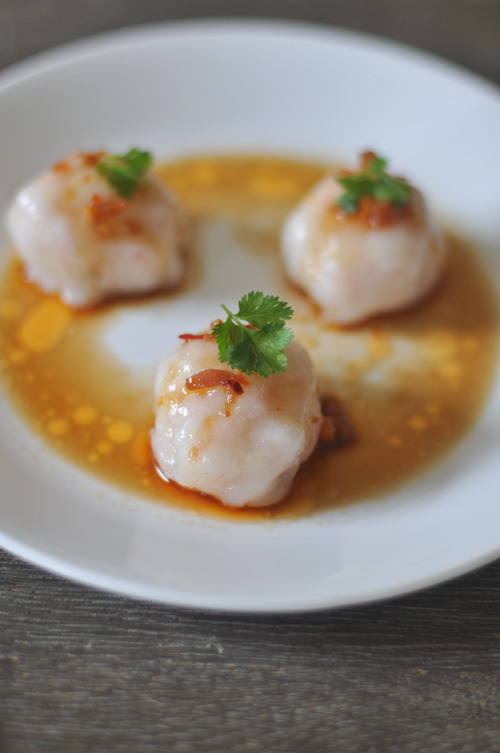 This is one of those recipes that wasn’t meant to make it to the blog. On my way home from work tonight I thought that, since my husband was working late, I might kill time by making some fresh pasta. I stopped by the fish monger and found some fresh prawns and thought that a nice creamy bisque sauce would work well with it. I was wrong. It didn’t work well with it… it worked SUPER DUPER WELL with it! It was so good, I knew I would do you a disservice if I didn’t share it. 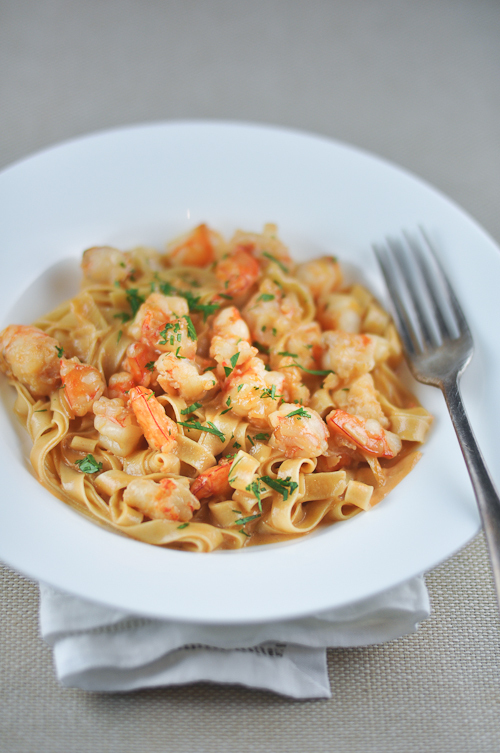 So – here it is – prawn pasta with a bisque sauce. 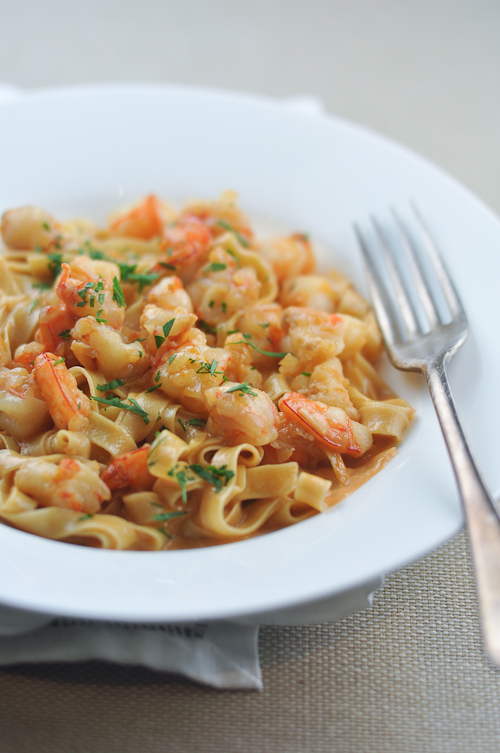 Have you got a favourite seafood pasta recipe? Well, now you do! Recipe for fresh pasta can be found here. 45 ml olive oil plus another 30 ml to fry the prawns. In a large pan, heat the olive oil and add the onion, carrot and celery. Cook until the onions are translucent, around 5 minutes, then add the garlic cloves. Season with salt. Peel and devein the prawns. Chop the meat into large pieces and set aside for use later. Place the prawn heads and peel with the vegetables and saute for around 5 more minutes. Add 750 ml of water and allow to simmer until the liquid havles, around 50 minutes to 1 hour. When the sauce has reduced, strain the sauce and add the cream, continue to simmer until the sauce thickens. Taste and season as required. Heat the 30 ml of oil in another pan and fry the prawns until cooked, around 3 minutes. Add this to the bisque/cream sauce. Meanwhile, heat a large pot of water until boiling. Salt the water once it reaches a boil and add the fresh pasta. Cook until al dente. Drain the pasta and add to the bisque sauce. Place in serving bowls and sprinkle with parsley.